Hmm. I see to have gotten a photo of the only part of this plant without a bee. Oh no, I see the bee–it was hiding! It’s a bumble bee, almost all the way at the bottom of the most upright part of this plant in the foreground. 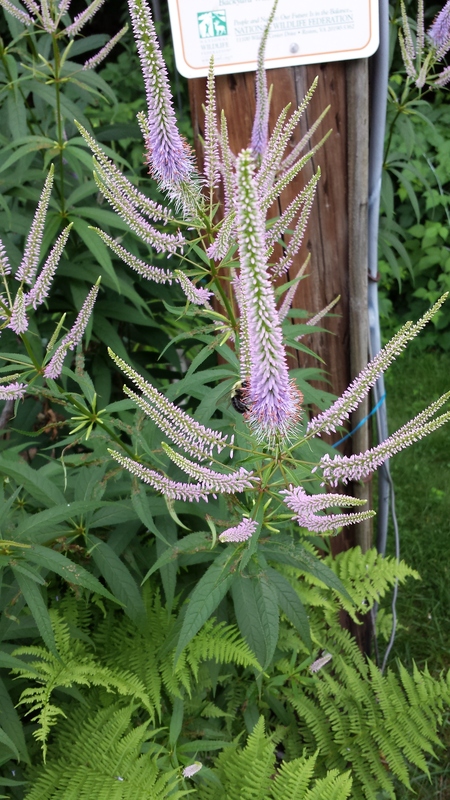 This is veronicastrum. It’s a native plant. Its common name is Culver’s root. I’m sure it has others. Once it blooms, it is just covered in bees. The bumble bees were playing “tag” with each other to get onto this plant. And while I was watching and photographing them, they were also all over the cone flowers that I had planted as well. That made me very happy. And they were completely covering the blue stalks of the anise hyssop. So I’ve done my job well, at least as far as the bees are concerned. This is not a time plant, however. This is one of those plants that, when I lecture, I tell folks that it’s taller than I am and it’s wider around than I can spread my arms. That makes it great for the pollinators because there’s that much more of it to fight over. Scroll down to Monday’s post for a photo of this thing. It’s the big pink plant right next to the telephone pole. In fact. I have 6′ stakes all around it–and the telephone pole is part of my staking scheme! The only other things that are larger in that garden are a rogue L’il Kim hibiscus, a kolkwitzia and the Lady in Red hydrangea. But they are shrubs, not perennials. What’s particularly nice is that once this thing starts blooming, it will bloom for a long time because of the way the blooms form. There are only two varieties of this plant, a white one and this one. It’s a little hard to find–garden centers and native plant nurseries will often ahve it but it’s not going to be at the box stores. Catalogs will often have it as well. But for fuss-free pollinator gardens (so long as you have the space) I highly recommend it!